While cognitive models of the design process have long dominated, many design innovation approaches advocate the importance of exploring affective concepts such as emotion, meaning and lived experiences in the creation of innovations. We suggest the capacity to think abstractly – to question, make connections and broaden understanding based on affect and meaning – is a fundamental skill for the abductive problem solving characteristic of expert designers. There are, however, few tools to promote questioning and reflection based on affect within the design innovation process. We see a need for such tools in design innovation workshops, particularly for non-designers who are less experienced with this type of thinking. We prototype a novel creativity tool for exploring affect within design innovation processes. It utilizes Affect Control Theory's dictionaries of affective meanings for social events to explore affective space. The dictionaries contain standardized affective ratings for a range of concepts. These ratings allow the linking of concepts that have similar affective properties. The initial creativity tool prototype is illustrated within Dorst's (2015) Frame Creation design innovation method. We envisage the tool being one tool among a range used for the analysis of themes and the development of frames within design innovation processes. 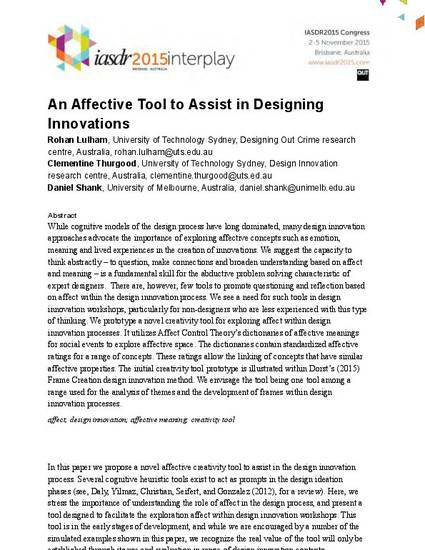 affect; design innovation; affective meaning; creativity tool In this paper we propose a novel affective creativity tool to assist in the design innovation process. Several cognitive heuristic tools exist to act as prompts in the design ideation phases (see, Daly, Yilmaz, Christian, Seifert, and Gonzalez (2012), for a review). Here, we stress the importance of understanding the role of affect in the design process, and present a tool designed to facilitate the exploration affect within design innovation workshops. This tool is in the early stages of development, and while we are encouraged by a number of the simulated examples shown in this paper, we recognize the real value of the tool will only be established through its use and evaluation in range of design innovation contexts. © 2008 IASDR, All rights reserved.